Teachers primary concern are the learners. They have to teach in order for their students to learn something. They use some tools in teaching such as books, visuals, and any other suitable materials. However, teaching is not as easy as that because they also have to be aware of the 5 Pedagogical Approaches which can enhance the process of learning. 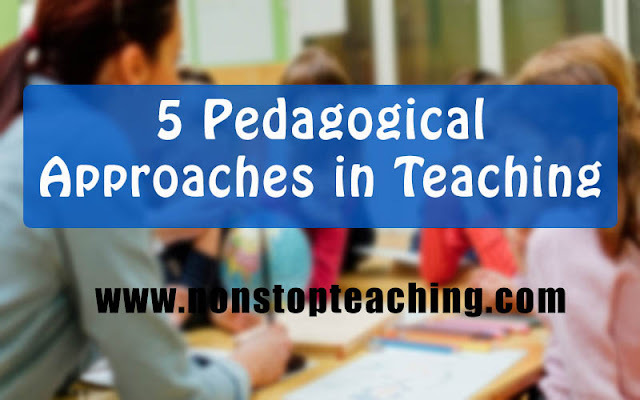 The Five 5 Pedagogical Approaches in Teaching are: 1. Contructivism or the Constructivist Approach 2. Collaborative Approach 3. Inquiry-Based Approach 4. Integrative Approach 5. Reflective Approach Constructivism or Constructivist Approach Constructivist teaching is based on constructivist learning theory. It based on the belief that learning occurs as learners are actively involved in a process of meaning and knowledge construction as opposed to passively receiving information. Learners are the makers of meaning and knowledge. Collaborative Approach Collaborative learning is a situation in which two or more people learn or attempt to learn something together. Unlike individual learning, people engaged in collaborative learning capitalize on one another's resources and skills (asking one another for information, evaluating one another's ideas, monitoring one another's work, etc. ).More specifically, collaborative learning is based on the model that knowledge can be created within a population where members actively interact by sharing experiences and take on asymmetry roles. Inquiry-Based Approach Inquiry-based learning (also enquiry-based learning in British English) is a form of active learning that starts by posing questions, problems or scenarios—rather than simply presenting established facts or portraying a smooth path to knowledge. The process is often assisted by a facilitator. Inquirers will identify and research issues and questions to develop their knowledge or solutions. Inquiry-based learning includes problem-based learning, and is generally used in small scale investigations and projects, as well as research. The inquiry-based instruction is principally very closely related to the development and practice of thinking skills. Integrative Approach Integrative learning is a learning theory describing a movement toward integrated lessons helping students make connections across curricula. This higher education concept is distinct from the elementary and high school "integrated curriculum" movement. Integrated studies involve bringing together traditionally separate subjects so that students can grasp a more authentic understanding.Interdisciplinary curricula has been shown by several studies to support students’ engagement and learning. Specifically integrating science with reading comprehension and writing lessons has been shown to improve students’ understanding in both science and English language arts. Reflective Approach Reflective teaching is a process where teachers think over their teaching practices, analyzing how something was taught and how the practice might be improved or changed for better learning outcomes. Some points of consideration in the reflection process might be what is currently being done, why it's being done and how well students are learning. You can use reflection as a way to simply learn more about your own practice, improve a certain practice (small groups and cooperative learning, for example) or to focus on a problem students are having. Let's discuss some methods of reflective teaching now.